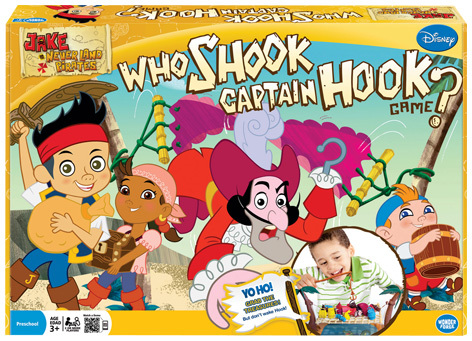 Home > Reviews > Who Shook Captain Hook? One of Disney’s strongest licences is Jake and the Neverland Pirates. With plenty of toys and role play accessories available for little boys to pretend to be a pirate, the Who Shook Captain Hook? game is a natural addition to the product ranges. Distributed in the UK by Esdevium Games, it features a spinner that decides which pieces are played next. This exciting board game features a sleeping Captain Hook surrounded by hanging treasure. Players have to take it in turns to carefully remove the pieces of treasure without waking the Captain, therefore tipping him out of his hammock into the Tic Tock crocodile infested water! Reminiscent of games like Buckaroo where dexterity and a steady hand are paramount, Who Shook Captain Hook? is great fun for all kids aged 4 and over. Please tell us what you think of Who Shook Captain Hook? by Asmodee UK Toys.